Hams like members of the Mogollon Rim Collins Collectors Club (K0CXX)*, play an important role in the preservation of vintage radio equipment. 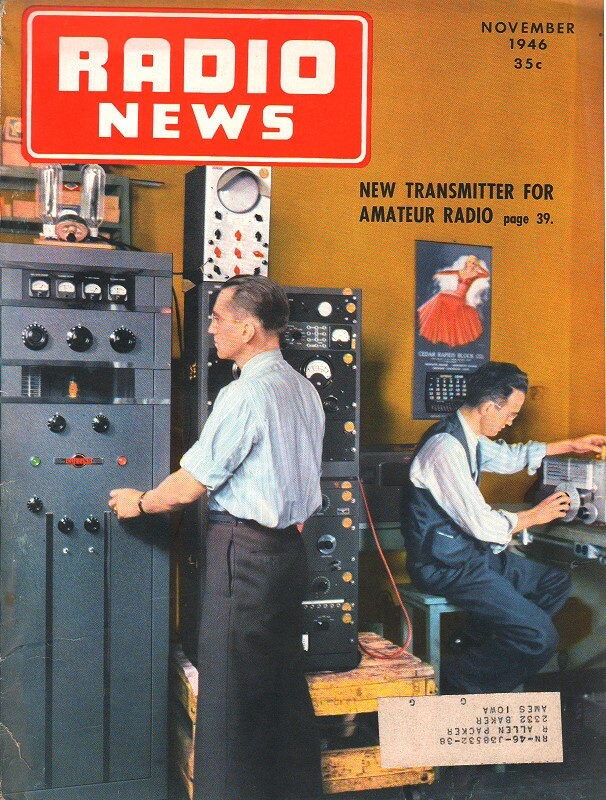 They own a nice example of a Collins model 30K-5 medium power (250 W) AM transmitter (photo at right) that is the subject of this 1946 article in Radio News. At 5½ feet tall and weighing 350 pounds, the 30K is many times the volume and weight of a modern solid state transmitter (transceiver + PA) having the same capability. Its advertised price in 1946 was $1,450, which is equivalent to $17.7k in 2014 money - obviously not in the affordability range of your typical amateur radio enthusiast. * Many such websites and photos of the K30 exist, but I chose K0CXX because they have model airplanes hanging around the building. Introducing the salient features of a new transmitter which is designed to fulfill the needs of a large part of the medium-power ham fraternity. 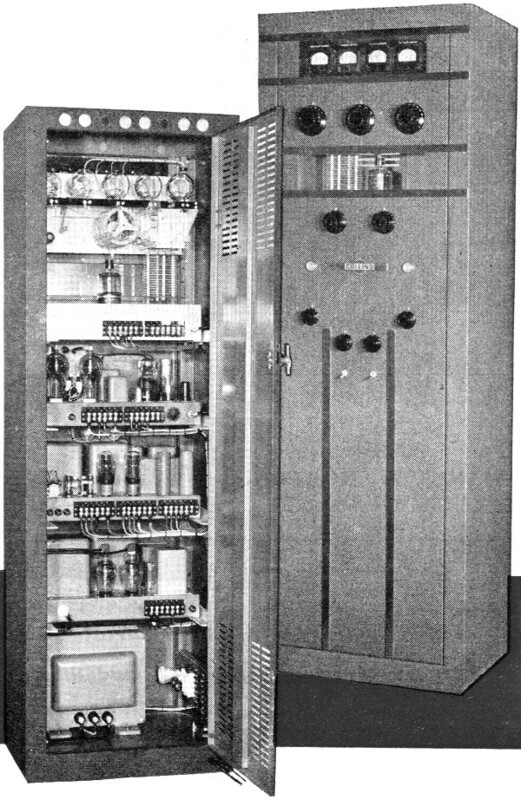 Skillful design is combined with sturdy construction in this Collins 30K transmitter. The new Collins 30K has many features that are considered highly desirable in amateur radio. A large number of the more than seventy-five hams in the Collins organization had a voice in its specifications. After thorough consideration of all their suggestions, the design engineer selected the following as the features that could be included consistent with versatility and economy: 1. 500 watts input on c.w., somewhat less on phone; 2. single ended output; 3. complete neutralization on all bands; 4. low driving power; 5. band-switching; 6. v.f.o. control, highly accurate and stable; 7. fixed bias; 8. electronic keying; 9. minimum power supplies; 10. high efficiency; 11. high level class "B" modulation; 12. speech clipper; 13. low pass audio filter; 14. single control operation; 15. accessibility for operation and maintenance. The result is a versatile, thoroughly engineered transmitter with high performance and easy operation. A more detailed description of the circuit and components follows. 1. Power input. 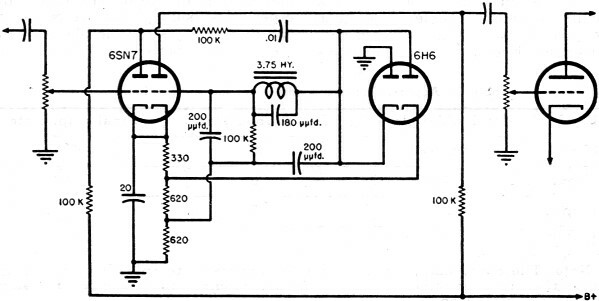 A power input of 500 watts on c.w. and 375 watts on phone was chosen because it is obtainable with low exciter power requirements, moderate tube costs, and economical power supply design. The 115 volt, 60 cycle a.c. power consumed by a transmitter of this size does not require special wiring. 2. Single ended r.f. stage. An Eimac 4-125A is used in the final r.f. stage. This tube is admirably suited to features 1 and 2. Using one tube in a single ended output greatly simplifies bandswitching, since only one end of each coil is switched. The 4-125A, a notable advance in beam power tetrode development, easily handles the desired power. Its high efficiency (75% to 80%) assures maximum power output. The grid driving power required is well below 10 watts and can be supplied from a low powered exciter setting on the operating desk. 3. Neutralization. The 4-125A is again suited to the purpose. It requires no neutralization, even on 10 meters. Thus the circuit is simplified and a clean signal is transmitted on all bands. 4. Low driving power. Discussed under the second feature. 5. Bandswitching. The 30K has bandswitching throughout, so that the operator can change bands quickly. This is particularly desirable on the higher frequency bands which usually are open for a limited number of hours each day. Five separate tank coils are utilized (10 and 11 meters use the same coil), each with its own variable link. The link couples the antenna or feeders to the cold end of the plate coil. All links are mechanically coupled together and are operated by a control knob on the front panel. They feed directly into 52 ohm to 73 ohm transmission lines. For higher impedance transmission lines an external tuning circuit should be employed. Either balanced or unbalanced antennas can be used. 6. V.f.o. control. This was accomplished with a high degree of success. The dial is calibrated directly in frequency. The exciter unit will be discussed in detail in the latter part of this article. 7, 8, 9. Power supplies. Economical design dictates that the power supplies be kept to a minimum. A high voltage supply, low voltage supply, and a bias supply provide all the d.c. power required by the 30K. A single high voltage supply feeds both the r.f. power amplifier and the modulator tubes. Since the 4-125A tube requires high voltage and low current, as do the 75TH modulators, a pair of 866A rectifiers can deliver easily the required plate current for both stages. The low voltage supply provides voltage for the 4-125A screen, the speech amplifier, and the modulator driver. It also supplies bias voltage for the 4-125A and the modulator tubes. With the 4-125A biased to cut-off, keying can be accomplished in the exciter. 10. High efficiency. In the 30K circuit, plate efficiency of the 4-125A is between 75 and 80%. The tank and coupling circuits are designed for low loss, thus delivering maximum power to the antenna. 11, 12, 13. Speech equipment. Speech amplifiers and modulator equipment are on one chassis located in the transmitter cabinet. The audio input will accommodate either crystal or high impedance dynamic microphones. The amplifier is conventional, with the exception of the speech clipper and filter employed. 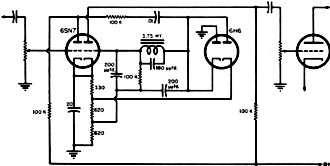 Clipper circuit employed in transmitter. Prior to the development of the 30K, a considerable amount of investigation in the laboratories had proved the advantages of audio peak clipping. In congested frequencies such as amateur bands, or in adverse atmospheric conditions, peak clipping raises the effective modulation level and provides greater intelligibility at the receiving end. It also prevents over-modulation, because audio peaks and transients are clipped before reaching the modulator. A low pass filter, following the speech clipper, attenuates all frequencies above 4000 c.p.s. This cut-off frequency is high enough to preserve the naturalness of the voice, yet eliminates excessive bandwidth. In field tests, listeners have reported that the 30K takes a comparatively narrow band width in amateur bands. A pair of Eimac 75TH tubes are utilized as modulators. The modulation transformer has a separate winding for modulating the 4-125A screen. A manually operated "phone-c.w." switch is located in the modulator unit, and is controlled by a knob on the front of the transmitter. For c.w. operation, this switch opens the filament circuit of the modulator tubes and shorts the secondary of the modulation transformer. The audio gain in the speech amplifier is controlled by a knob on the front panel. The clipping level is adjusted manually from the rear of the cabinet, and can be set to occur at any desired percentage of modulation. 14. Single control operation. The transmitter plate switch and the exciter switch are connected in series. Just by leaving the transmitter switch in the "On" position, the exciter switch will have complete control of transmitting and receiving functions. The exciter switch has an extra section for use as a receiver disabling switch. If push-to-talk operation is desired, the "push-to-talk" switch is connected in series with the plate control section of the exciter switch. Both transmitter and exciter switches are left in the "transmit" position. An extra relay is then necessary for disabling the receiver. Calibration procedure is unchanged. Terminals are provided for operation of a receiver disabling relay, and also for an antenna change-over relay in the transmitter. 15. Accessibility. The cabinet is of sturdy welded steel construction. All units, tubes, and wiring are easily accessible through the full length rear door. Electrical interlocks break all high voltages when the cabinet is opened. The door may be locked with a key to prevent entrance by unauthorized persons. All operating controls are conveniently located on the front panel. Meters are mounted on an insulated panel located behind a glass window near the top of the transmitter. Another window permits observation of the 4-125A d. amplifier. The exciter unit for the 30K can be adapted easily to drive a variety of higher powered transmitters. All circuits are ganged together and controlled by a single tuning knob. The variable frequency oscillator is a peacetime application of a rugged and highly stable wartime development. The dial is calibrated directly in frequency, and is accurate to within 1 kc. in the 40 meter band. Accuracy on the other bands is directly proportional. The 1 kc. allowable deviation includes the frequency error due to all normal operating conditions. The v.f.o. operates in the 160 meter band. One control bandswitches all circuits simultaneously. The exciter covers the 80, 40, 20, 15, 11, and 10 meter bands. In the "calibrate" position, the exciter can be tuned to zero beat with a received signal without turning on the transmitter. Electronic keying provides fast, clean c.w. operation. When the key is removed from the jack, the circuit is automatically closed for phone operation. The exciter output is fed through a 73 ohm coaxial transmission line to a link on the grid coil in the transmitter. Operation of the exciter is extremely simple - one control switch, a bandswitch, and single dial tuning. It can be used either as a transmitter or as a versatile exciter. Frequency control is rapid, accurate, and reliable. The 30K has been given strenuous and critical tests in actual amateur operation. The ease and reliability of operation were firmly established. As was expected, the speech clipper was highly satisfactory, and effectively raised the modulation level. The signal was kept clean, and intelligibility was definitely increased. The low-pass audio filter maintained a narrow band width. It can be said truthfully that the clipper enabled the operator to obtain and maintain solid contacts that would have been lost otherwise in static and crowded frequencies.